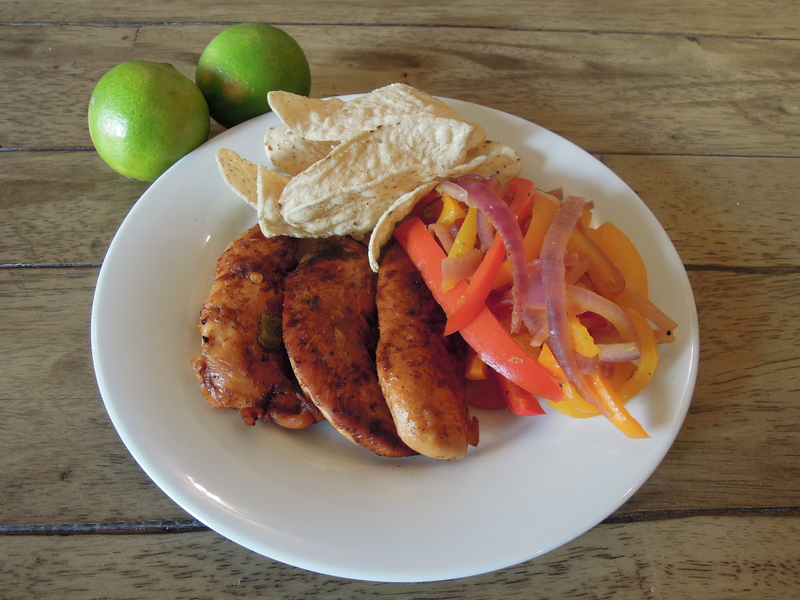 The inspiration for this meal started with a craving for chips and salsa. I knew I needed something to accompany the craving (besides a margarita) so I decided to turn my favorite cocktail into a marinade. It was purely experimental and I had no idea how well it would turn out. Plus, I figured that if it was a complete fail Robert and I’d both be okay calling chips and salsa dinner if we absolutely had to. Happily, that was not the case. The marinade couldn’t be more simple: Some tequila, juice of four limes, juice of one orange, chopped jalapenos, fresh garlic, chili powder, salt and pepper. That’s it! I covered about a pound of boneless skinless chicken breast tenders in the marinade and stuck it in the fridge for about three hours. I went with the tenders because it was Friday, I was tired, and I knew they’d cook quickly. But I already can’t wait to use the marinade for chicken breasts and flank steak on the grill! I cooked the chicken in a cast iron skillet on the stove and served it with some sauteed red onion and bell peppers for a kind of deconstructed fajita. You could totally use this recipe for actual chicken fajitas, a homemade burrito bowl (I’m not sure I’ve ever mentioned my deep love for Chipotle here), or a simple salad topped with the delicious, spicy, tangy chicken. Truly, the options are endless and I can pretty much guarantee you’ll be seeing this margarita lime recipe again here and hopefully in your home, too. 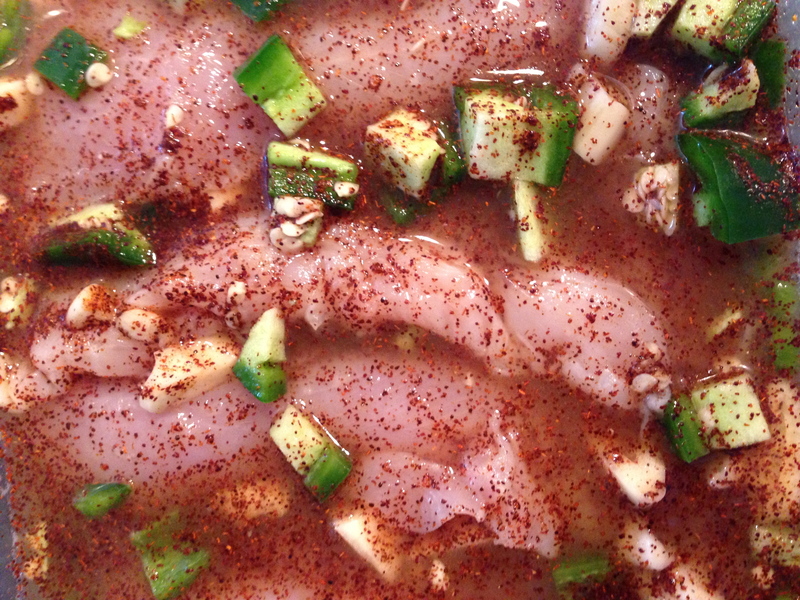 Combine chicken, tequila, lime juice, orange juice, jalapenos, garlic, chili powder, salt and pepper in a bowl. Cover and marinate in the fridge 1-3 hours. Heat oil in a cast iron skillet over medium-high heat. Add half the chicken and pour just enough marinade to cover the bottom of the skillet. Cook about 3-4 minutes per side until cooked through. Remove chicken to plate and repeat with remaining chicken, again covering the bottom of the skillet with some marinade. For the Peppers and Onions: In a separate skillet, sauté 1 sliced red onion and 3 sliced bell peppers with olive oil and salt and pepper for about 8 minutes. Remove to a bowl and top with about 1 tsp lime zest. 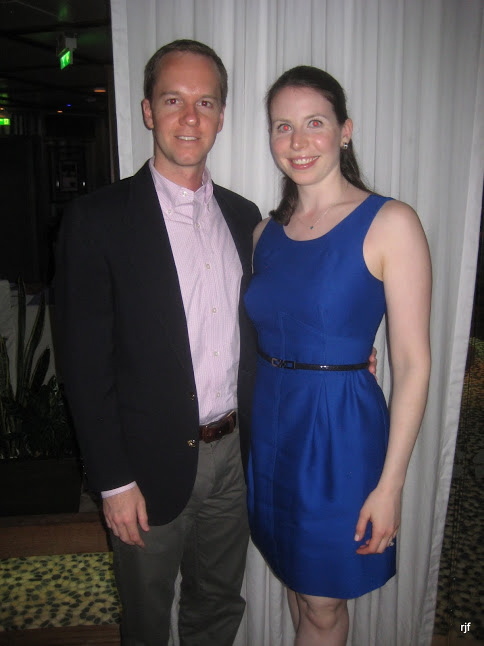 This entry was posted in Chicken on April 8, 2013 by Paige Greenfield. Robert does this thing where if he really, really, realllllllly likes something he’ll declare it “top 5” or “top 10” of all time. Like these flaky biscuits he had in Sonoma this fall? Top 5 of all time. I think that entire breakfast ranked in the top 5 or top 10. I can’t remember. It was pretty spectacular. Well, as I bit into one of these chicken lettuce wraps I immediately exclaimed, “top 10 meals I’ve ever made!” I don’t know if I was more in shock that those words came out of my mouth or because it was true. I could eat these once a week every week for the rest of my life and be happy as can be. 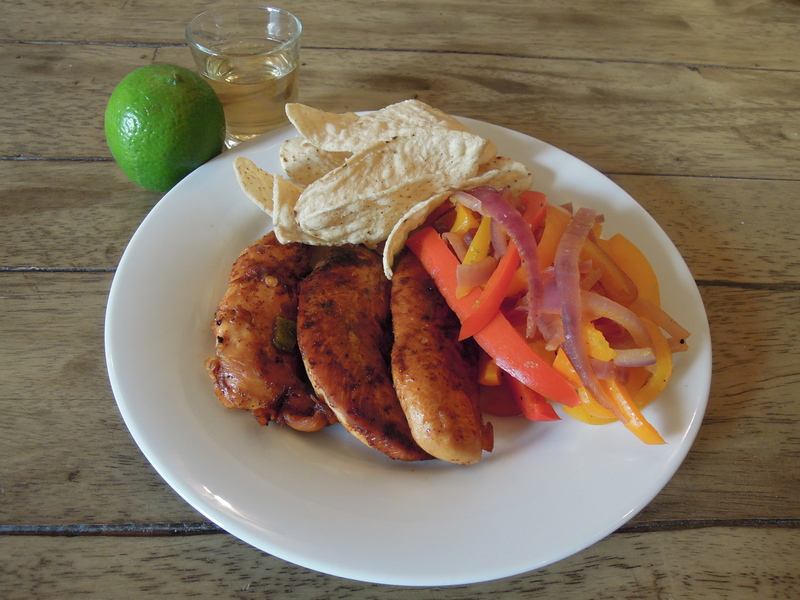 They’re just the perfect combination of good for you foods (ground chicken breast and veggies! ), texture (both soft and crunchy elements — the water chestnuts make all the difference in the world), and flavor (just wait until you see the list of ingredients in the sauce.) But worry not, all of the sauce ingredients are items you already have in your pantry or a good excuse to stock up. These wraps are outstanding. They really are. The first time I made the recipe (a riff on PF Chang’s version) I followed the instructions exactly as stated in this link. (I think I found it on Pinterest, though it’s a wonderful blog.) I’ve never actually had PF Chang’s lettuce wraps, though I’m certain I’d love them. After I made the recipe I decided there were just four small tweaks I’d make: Double the recipe so we’d have leftovers for lunch; add diced red bell pepper for more color and nutrition; increase the amount of sriracha for added heat (omit if you’re a spice-phobe, which I used to be); and serve with Boston lettuce instead of iceberg to keep the crunch but add a little more nutrients. Each tweak ended up having the exact effect I hoped it would. Some extra Sriracha for good measure. I don’t even know who I am anymore. Ultimately, I ended up serving it platter style instead of creating wraps because they get pretty messy when you wrap them up. You kind of have to eat the whole thing without putting it down between bites. But in case you love the lettuce wrap approach, know that Boston lettuce wraps just as well — and in some ways even better — than iceberg. In a large skillet, heat olive oil (1 to 2 Tbsp) over medium-high heat. Add onion, season with some salt and pepper, and saute about 3-5 minutes. Add chicken. 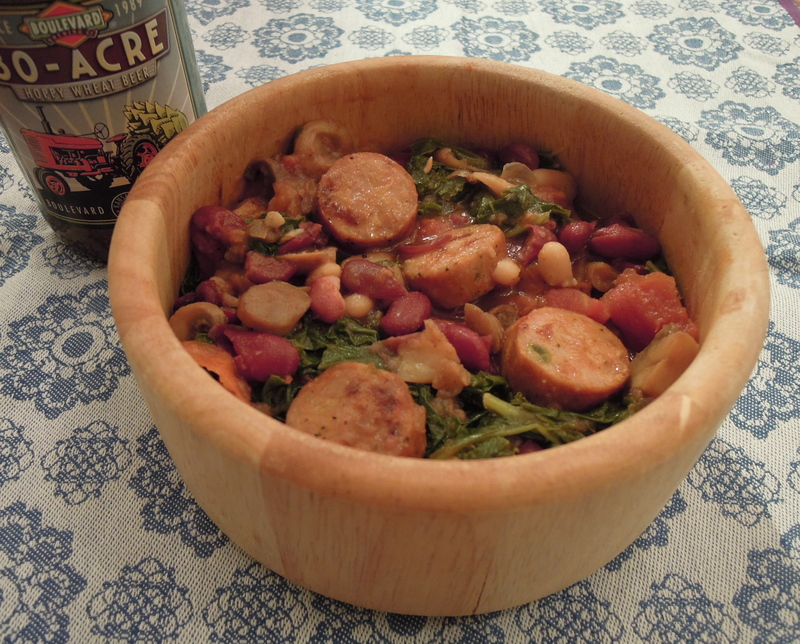 Use a wooden spoon to break up meat and cook until chicken is nearly done, about 8-10 minutes. Add red pepper, garlic, and ginger. Cook until chicken is cooked through. Combine sauce ingredients (toasted sesame oil through Sriracha) in a microwave safe bowl and microwave for about 20-30 seconds. Whisk until combined. When chicken is cooked, add sauce to chicken mixture in the skillet. Stir to combine. Add green onions and water chestnuts. Cook until green onions begin to soften and water chestnuts are warm, about 2-5 minutes. Add chopped peanuts, stir to combine. 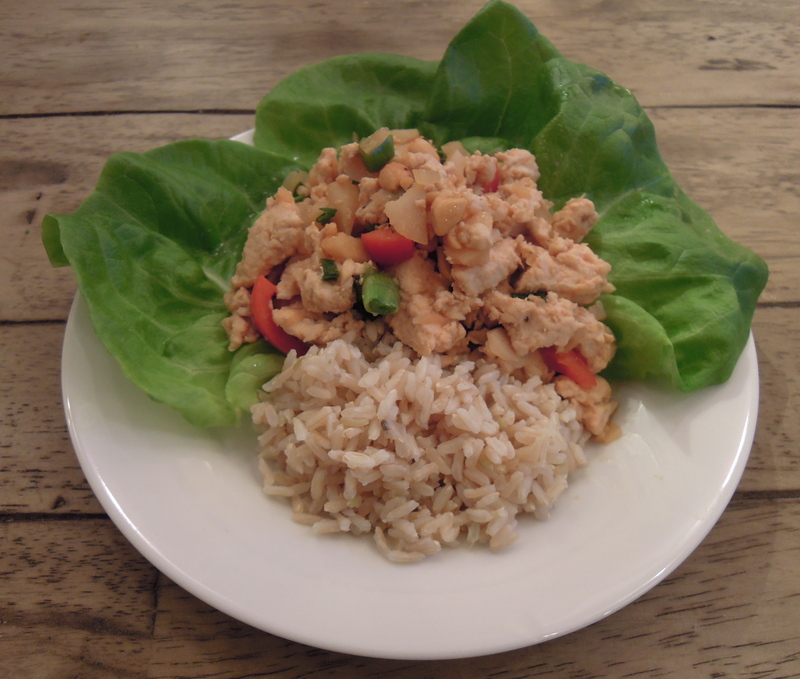 Serve chicken mixture with lettuce leaves (wrap the chicken in the lettuce if you like) and brown rice. 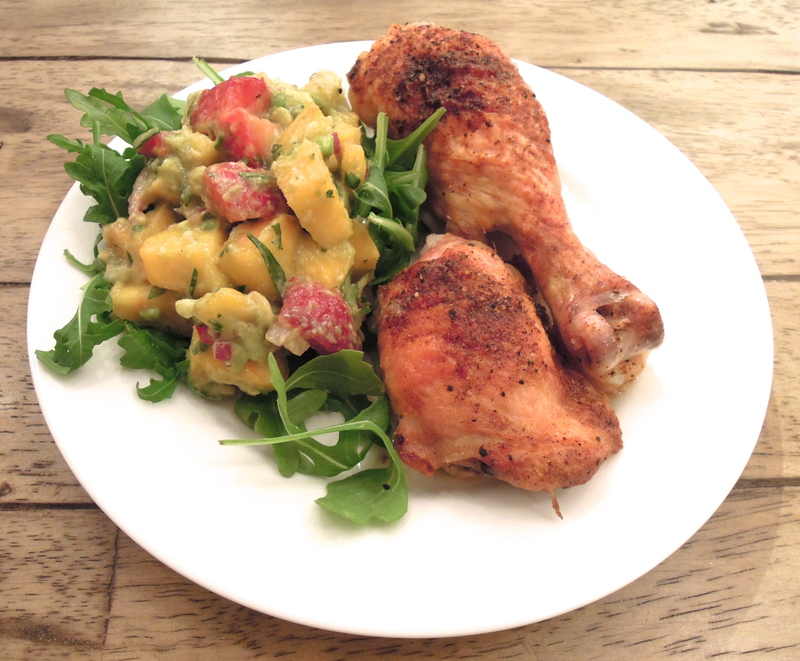 This entry was posted in Chicken on February 28, 2013 by Paige Greenfield. But the truth is although these mega life events came to fruition within a single week in August, I had been planting the seeds all year long and even before 2012: I took the leap and signed up for yoga Teacher Training early in the year; I scored the writing contract at the end of 2011 and pushed my writing limits throughout most of 2012; and Robert and I had been building the foundation of our relationship since the day we met in 2010 (though I had no idea he would ask for forever in 2012). When I look back at the magical milestones that occurred in 2012, they’re a great reminder of just how far hard work, dedication, and following my heart can take me in my life. They’re also a great reminder for those moments, down the road, whenever I feel stuck that when I keep pushing forward, stay focused, and challenge myself in new ways marvelous things can happen. Of course there were countless highlights that occurred outside of that week including a few trips to California (L.A., Carmel by the Sea, San Francisco, and Sonoma), New York, Vermont, Kansas City, Michigan, Florida, FRANCE, and a Christmas cruise with Robert’s family. 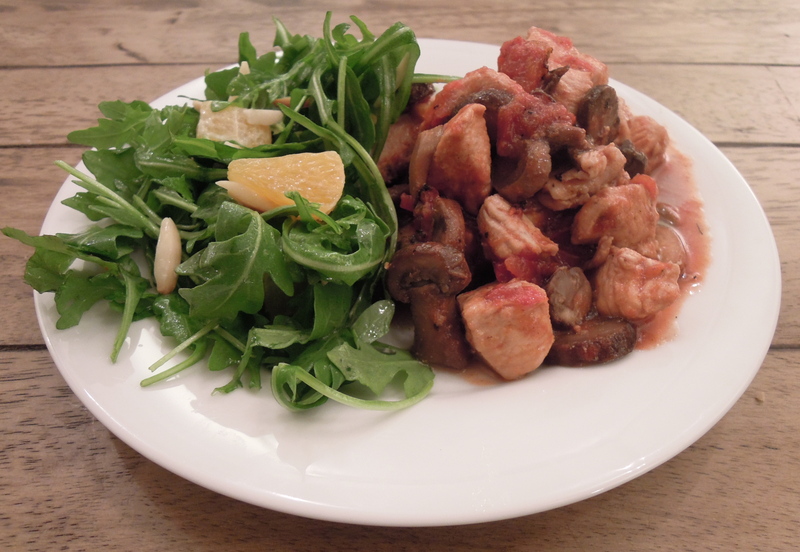 For now, I thought I’d kick off the year with a super simple, super delicious, and super healthy home-cooked meal: Chicken with tomatoes and mushrooms. It doesn’t get any simpler than this, folks. 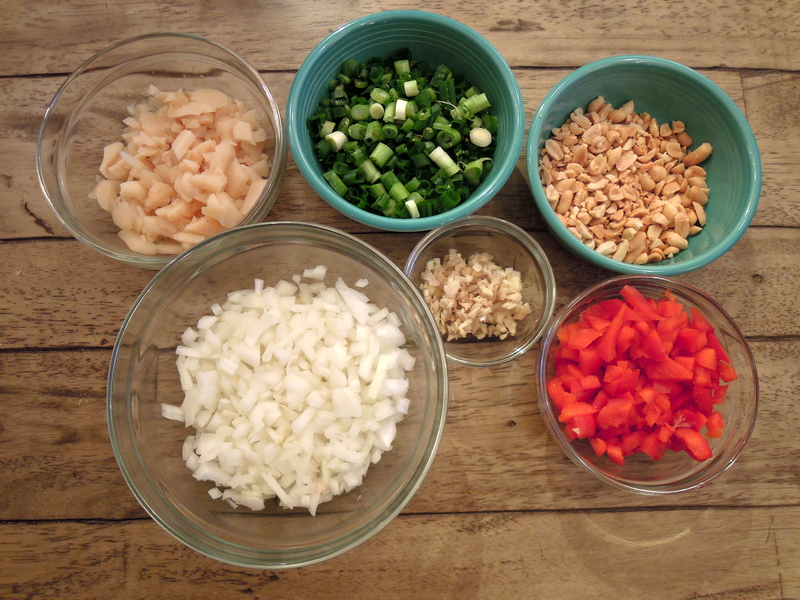 Just three ingredients (four if you count the two cloves of garlic (not pictured)…five if you count dried oregano…). Point is: that’s it! With so few basic and inexpensive ingredients it’s a great step toward my eco friendly and budget conscious goals for 2013. It kind of tasted like a stripped down chicken cacciatore. At one point I contemplated adding some onion or even a little red wine, but I wanted to see what would happen if I kept things as simple as possible. 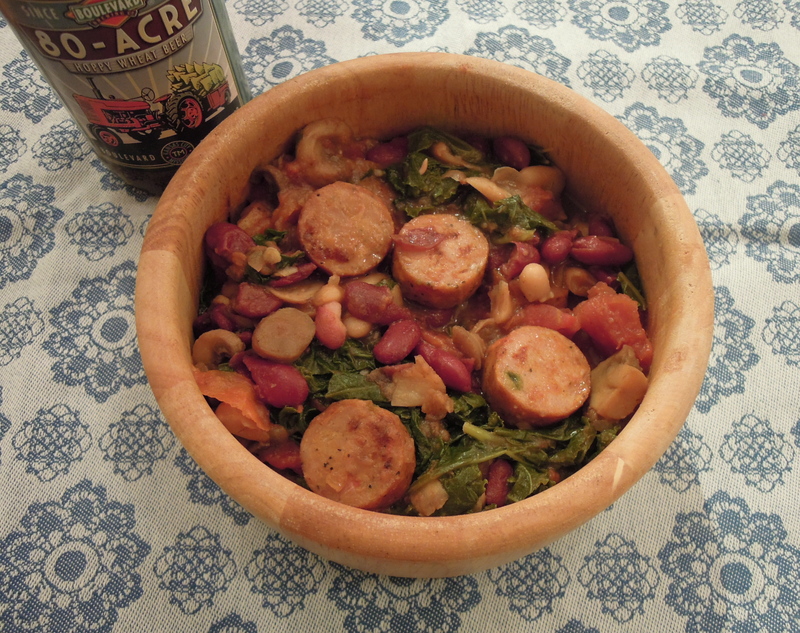 I’m so glad I did–it was the kind of soul-warming food you want in early January, took less than 30 minutes to prepare, and created very little mess to clean up (it’s a one-pot meal). I served it over brown rice with a simple salad of arugula, fresh navel orange, toasted blanched almonds, and a dressing of olive oil, lemon juice, and salt and pepper. In a word: success. Cut chicken into 1 inch cubes. Heat olive oil in large pot over medium-high heat. When hot, add chicken to pot. Season with salt and pepper. Cook chicken, turning to cook all sides, until cooked through. Transfer chicken to plate, cover with foil. Add minced garlic to pot and cook until fragrant, about 1 minute. 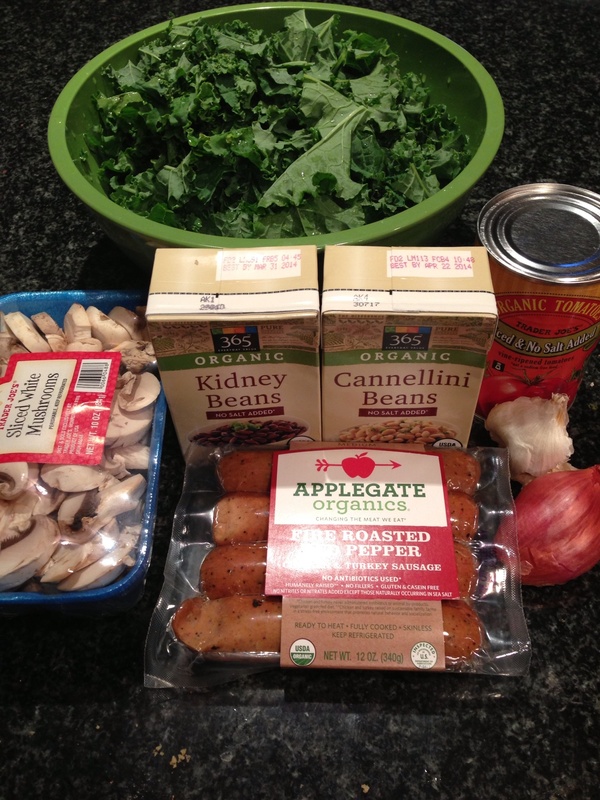 Add mushrooms, cover, and cook until softened, about 5 minutes. Add tomatoes and oregano. Cook, covered, until tomatoes break down, about 10 minutes. Add chicken and any accumulated juices back to the pot. Toss to coat and cover until chicken is heated through. 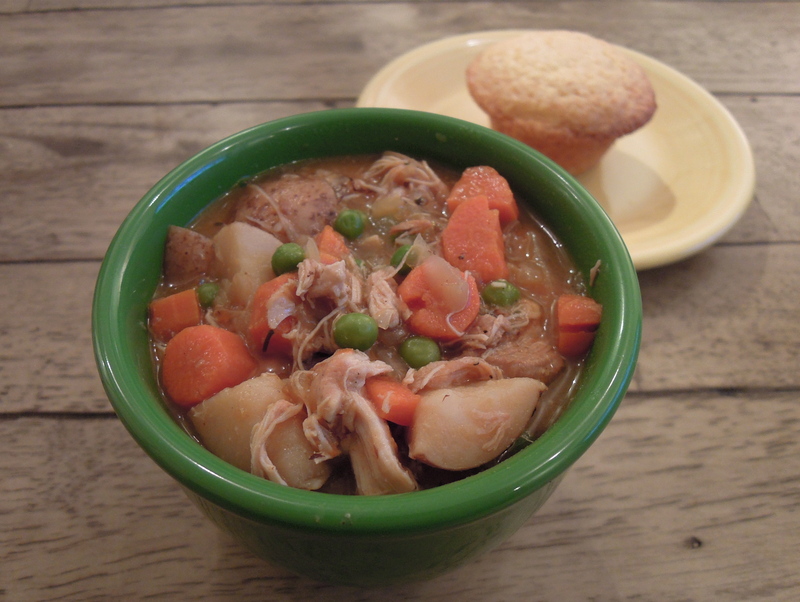 This entry was posted in Chicken, Life on January 3, 2013 by Paige Greenfield. I’m beginning to think that moments of culinary inspiration aren’t so different from artistic inspiration. Except, fortunately, artists don’t eat their work–for the most part anyway. The inspiration occurs when several different factors combine at once inside your head and bam! you’ve got an idea for dinner. At least that’s how it happens for me. 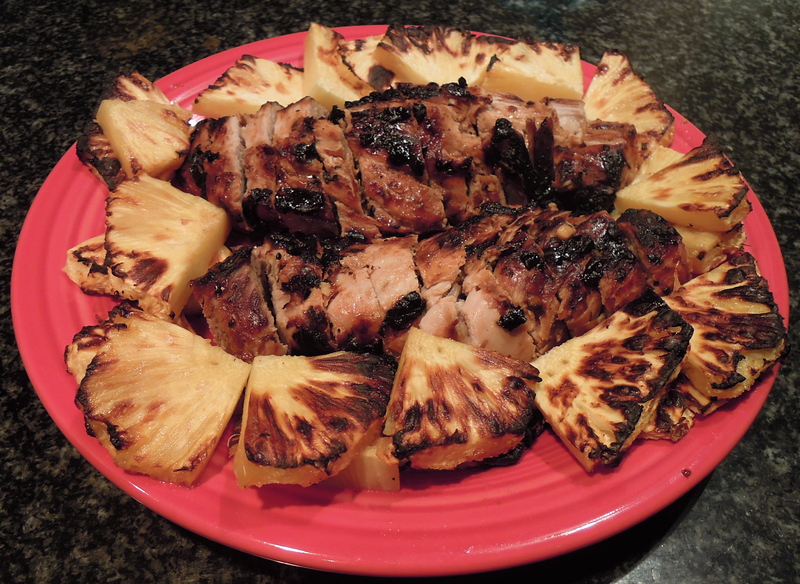 I loved every single part of this meal–the sweet glaze combined with the slightly salty pork, the juicy grilled pineapple, and especially the Asian inspired dipping sauce served on the side (not pictured.) Oh…the sauce! I couldn’t get it out of my mind. Hoisin, pineapple juice, soy sauce, ginger, and garlic. It’s like the best combination of flavors all in one bowl. Robert and I dipped our pork and pineapple directly into the sauce (it’s totally acceptable to do those kinds of things when there are only two of you sharing a meal.) There was also the fact that I bought an entire 32 oz bottle of organic pineapple juice for the original recipe that only required 2 Tbsp. Clearly I have a tendency to overestimate ingredients. So I was also on a mission to use up the juice. I heeded my father’s advice and with only one snafu (the meat was a little too close to the flame at first hence some charring (a.k.a. extra flavor that no one was complaining about)) and learned that a real gas broiler is actually a very easy, efficient, and tasty way to cook. And then, in a moment, all of these factors combined and the inspiration for broiled chicken thighs using the dipping sauce as a marinade sprung into my head. From there, the rest of the pieces (i.e. the sesame snow peas) fell into place. Ultimately, I took a slightly more involved recipe (the pork), which makes for a perfect weekend meal when you have a little more time and turned it into an easy peasy weeknight dinner. Just promise me you’ll try both? Deal. 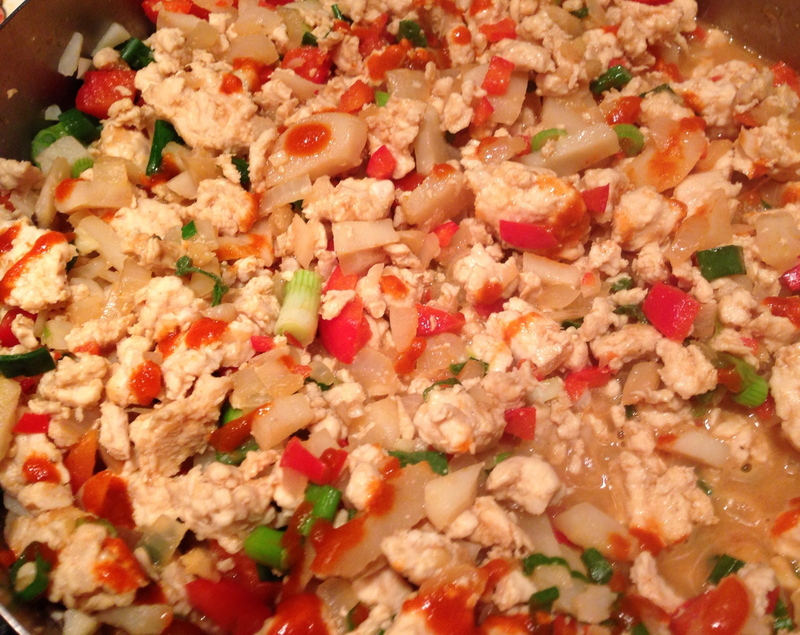 Add hoisin sauce, pineapple juice, soy sauce, mustard, ginger, garlic, and hot sauce in a bowl and stir to combine. Place chicken thighs in a bag, pour sauce on top, and marinate at least one hour. Heat broiler (on high if it’s an option.) 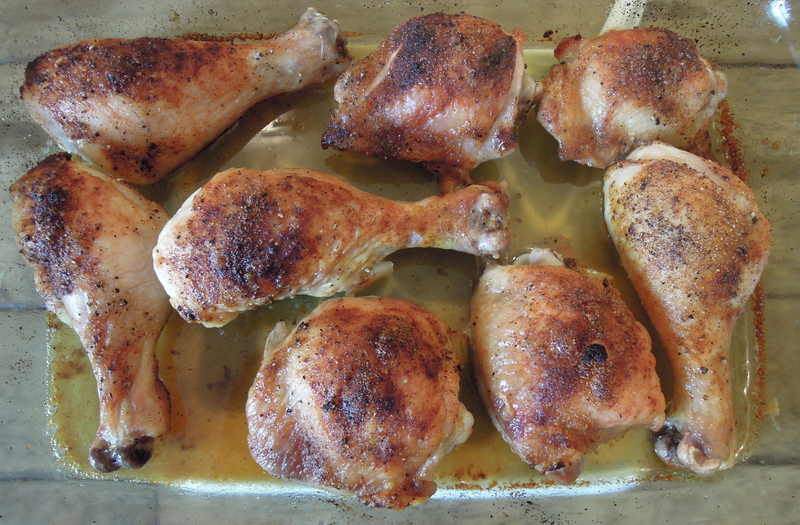 Place chicken on a broil-safe baking sheet lined with foil about 4 inches away from flame and broil about 6 minutes on each side. Steam snow peas for less than 1 minute until they turn bright green. Drain. 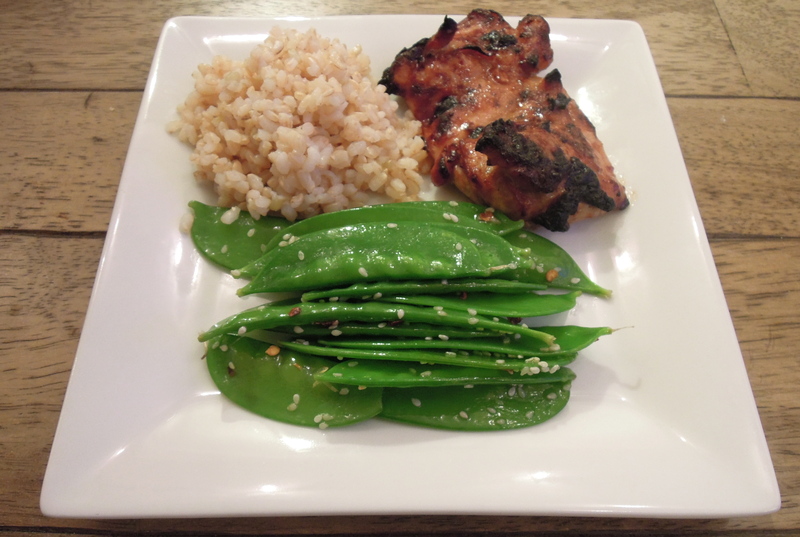 Toss snow peas in a bowl with sesame oil, sesame seeds, soy sauce, and chili peppers. 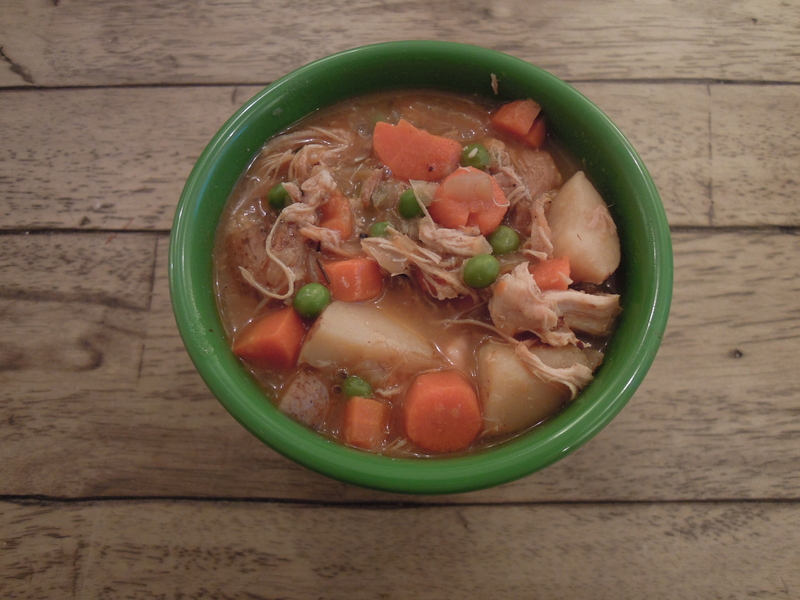 This entry was posted in Chicken, Vegetables on September 28, 2012 by Paige Greenfield.